I write often about the ‘been there – done that’ aspects of my sailing life. I’m lucky to have raced actively and cruised extensively for many years, but as we all know our sport continually offers new opportunities and experiences. This season I enjoyed a few firsts – truly enjoyed them – and was reminded yet again of how special sailing is. The weeks after Labor Day bring less crowded anchorages and it’s my favorite time to cruise…and this year we managed a few short jumps to Conscience Bay to drop the hook – and the blood pressure. We seem to gather with the same folks on these excursions, whether aboard our boat or as a flotilla. Nothing beats the brand of revelry, storytelling and relaxation when you’re settled in somewhere safe with people you trust and enjoy. For the first time (in a long time, at least), we simply hopped aboard with little planning and headed out. With so much on our collective plates these days, a spontaneous overnighter can seem like a honeymoon. On a recent daysail, I tendered the helm to my son – no doubt the best ‘first’ of my sailing life. He needed a little help keeping the boat going in a straight line, but I’d say he did quite well for a two-year-old. My father opined that he’s already a better helmsman than his father, and I could not disagree. I was so thrilled that I didn’t even attempt any sort of return volley for the old man. I look forward to, in years to come, sitting back and letting the young admiral do all the work while I take in the sights and sounds. With three generations of my family aboard, I don’t think I have had a more meaningful day of sailing in my life. Choose the people that you spend time on the boat with carefully. For most, these moments are rare – and most certainly treasured – from week to week and season to season. 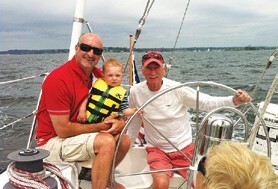 The right sailing friends and guests can make a good day on the water great! And sailing with family is best. I find that the collection of hijinks, stories and amusement helps fill those long winter days – and this year I am prepared for anything Mother Nature can throw my way! Throughout this issue, you’ll find stories of people reveling in all our sport has to offer, and you’ll read about others developing their own ‘firsts.’ I hope that your sailing season has likewise been full of special experiences with friends and family. When the air turns cold and the boat is safely tucked away, reflect on, laugh at, and most of all appreciate all that sailing affords us.